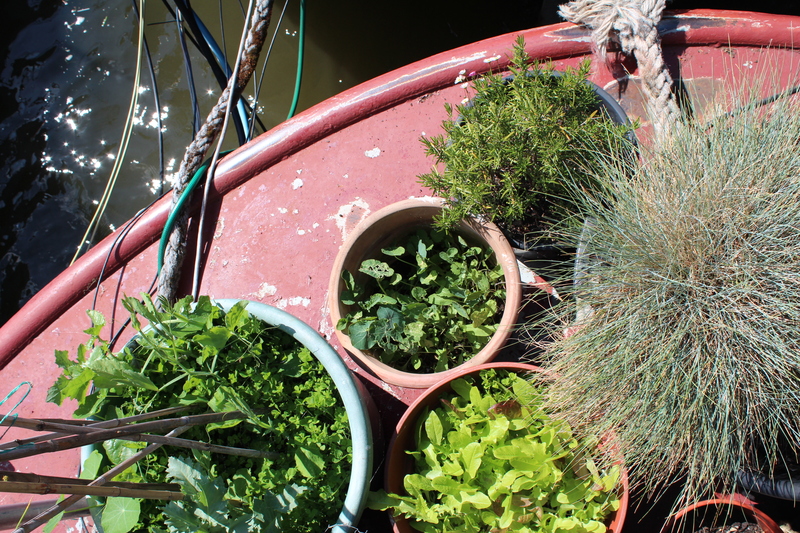 Last weekend I visited some floating gardens on the Thames, as part of the annual Open Garden Squares Weekend. 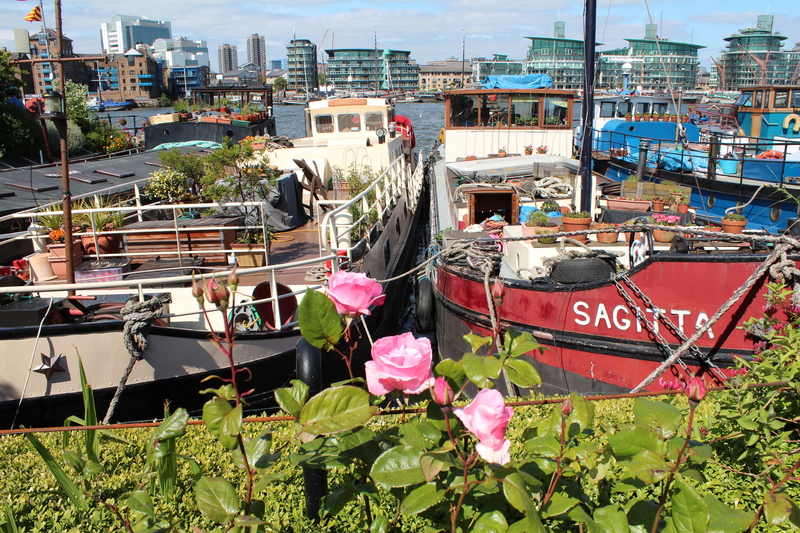 Garden Barge Square – also known as the Floating Barge Gardens – is built across the top of a number of boats on the Downings Roads Moorings, which boasts a pretty spectacular backdrop in the form of Tower Bridge. I regularly catch boats past these gardens but had no idea just how extensive they were until I ventured onboard. There are trees up here! 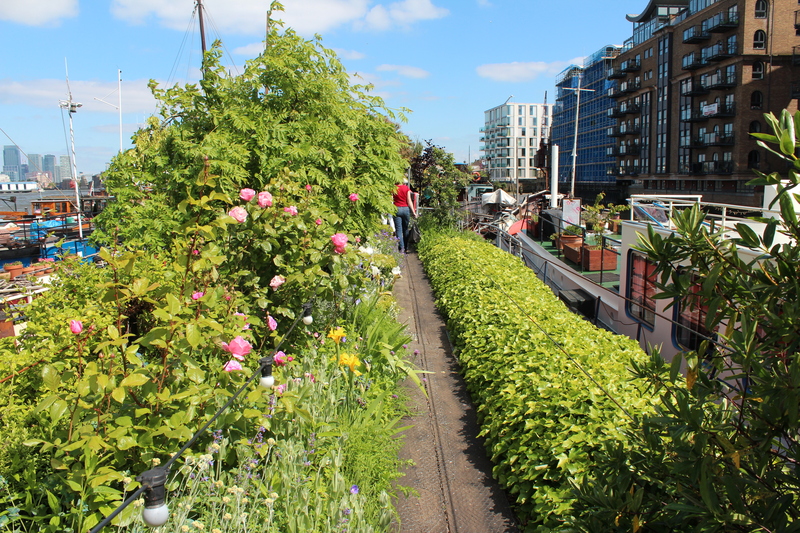 Much of the gardens are built across the top of the barges in metal trenches on either side of central pathways. The various boats are then connected via a series of walkways and bridges. 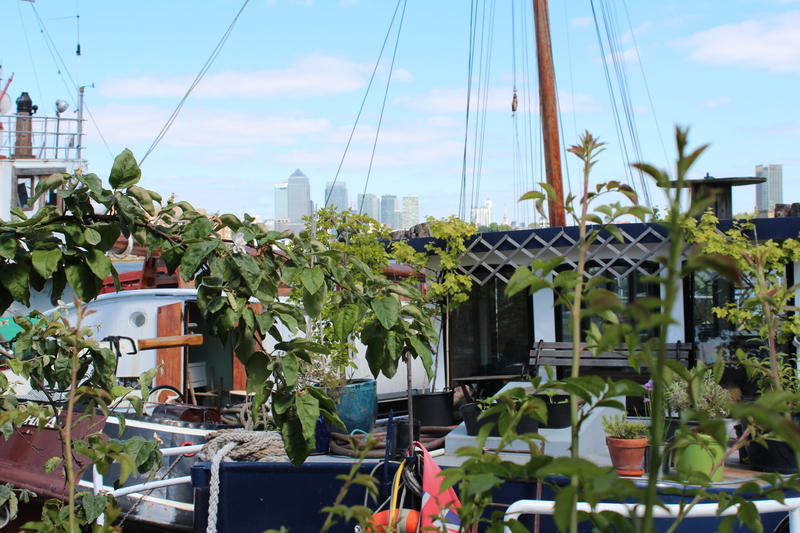 It’s very easy to forget that you are walking right across the top of someone’s boat – which is often their home as well, with over 70 people residing or having a studio on the 30+ boats moored here. 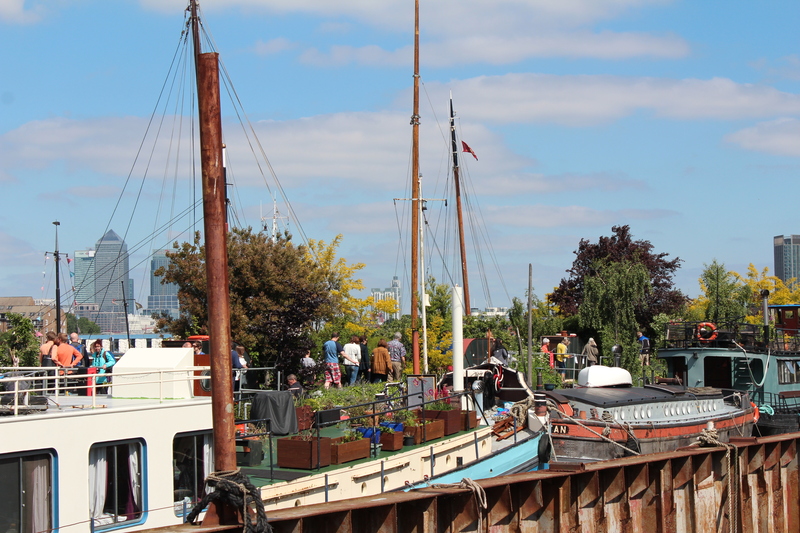 The waters along the Thames here are very rocky – much more so than on canals or marinas. You will definitely find yourself swaying with the motion for some time after you get back to dry land. The good news is that once you get over the initial narrow walkway that leads to the barges you feel much more secure in the garden areas themselves. And it’s worth it to visit this unique environment, though you’ll have to wait for the next Open Garden Squares event, scheduled for June 14th and 15th 2014. 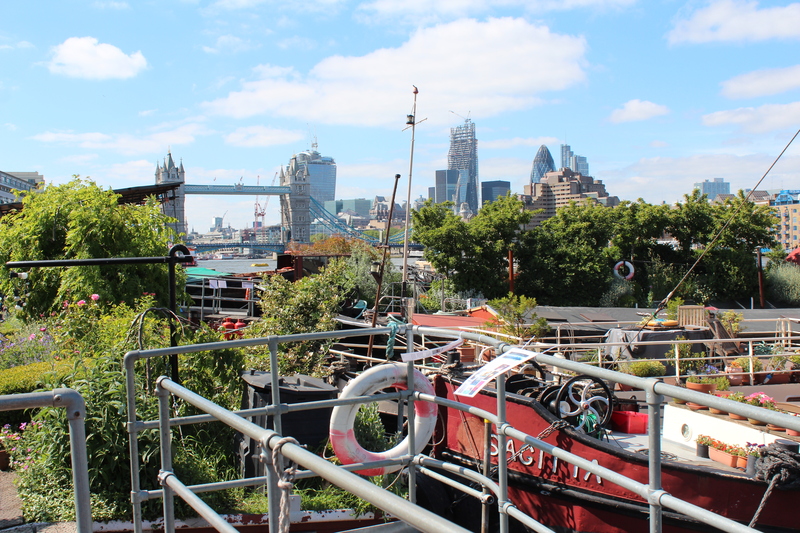 In the meantime, a good view of the barges can be gained from the Thames Path around Bermondsey Wall West. This entry was posted in Parks/gardens/open spaces, Quirky London, Thames and tagged Downings Roads Moorings, Floating Barge Gardens, Garden Barge Square, Jacob's Island, Open Garden Squares, Open Gardens, Thames, Thames houseboats by thelondonphile. Bookmark the permalink. Thanks for your messages! I tried to send you an email to the hotmail address that these comments appear to be linked to, but it bounced back. I also tried to find you on Facebook but you have that setting where people can’t add you as a friend. I’m the only person on Facebook with my name, so it should be easy for you to find me! I also sent you a message on there but as we’re not friends it will go to your ‘other’ message box and you may not see it. Just look me up on FB!